I love to dehydrate foods. 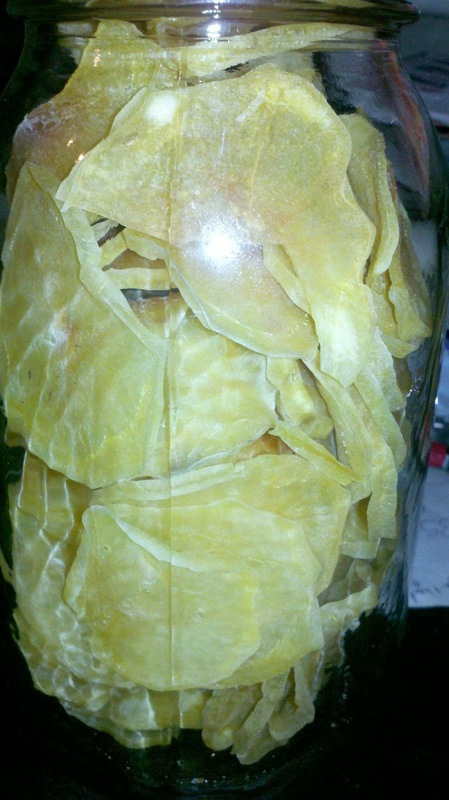 Dehydrated foods are great for long term storage and they take up a lot less space than freezing or canning. Today, I will teach you how to dehydrate potatoes. Ten pounds of potatoes, once dehydrated, will fit into just 3 quart jars. Talk about space saving! First, wash your potatoes. Once washed, you may peel the potatoes, but generally, I just leave the skins on. More nutritious this way and it eliminates a step if you do not peel them. Now, get your mandolin out. Just slice your potatoes. I use the "medium slice". As you slice your potatoes, have a pot of water on the stove heating up. Once the water begins to boil, drop the potatoes into the water and let them boil for just 3 minutes. 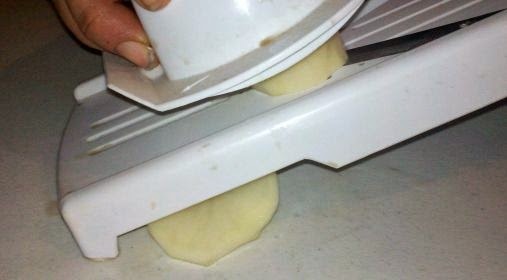 Once they have boiled for 3 minutes, drain them and run cool water over the potatoes to stop the cooking process. 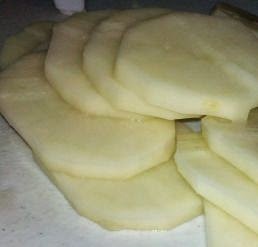 Then just lay the potatoes out onto your dehydrator trays and dehydrate. I turn on my dehydrator on before I go to bed and the potatoes are done the next morning. These actually are peeled but like I said previously, generally, I don't even bother to peel them. To reconstitute, just take the desired amount of potatoes and place in a pot or bowl and add enough of really hot water to cover the potatoes. Let set 10 minutes and they are ready to use. These can be added to soups, stews, or casseroles or you can pan fry or even mash for mashed potatoes. I really enjoy your posts on how to dehydrate so many vegetables. You have encouraged me to try a few and so far I have had good results. I like that is so easy and takes up little room. I really appreciate you taking the time to comment on my blog. It is encouraging to me. If you ever have any questions, please let me know. Hi, ever try to dehydrate chicken? I would like to know your thoughts. I have but I don't really like how it turns out but I think it's a personal preference thing. I do beef jerky frequently but just don't like chicken. I have tried this by making shredded potatoes. I only blanched them for 2 minutes, placed in my dehydrator. They did crisp up! But when I cooked them (after rehydrating) they did not stick together like hash browns should. Is there something I did wrong? I have had that problem myself. I soaked mine in ice water after they rehydrated and that seemed to help. Do you need to "treat" to keep from discoloring? I have never had a problem with them discoloring just by doing them the way I do. could you use a grinder to turn it into powder once they are dried for making mashed potatoes in the future? For making mashed potato flakes, I mash boiled potatoes (no milk) and spread the mixture onto the dehydrator trays and then dehydrate and then grind that up. The potato pieces shown above would be too hard to grind. Never evwn thought about doing this. Great idea.